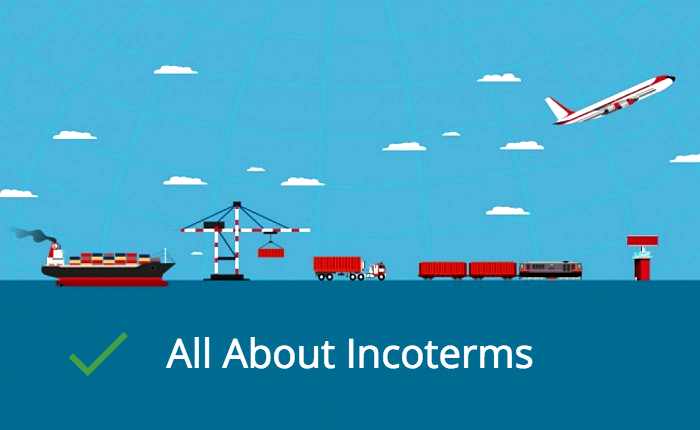 Incoterms is the short form for International Commercial terms. These terms relates to the sales contract and are used worldwide. INCOTERMS were first introduced in 1936 by International chamber of Commerce (ICC). These Incoterms were revised several times, latest being Incoterms 2010. A cargo may move several days before it arrives at its destination. 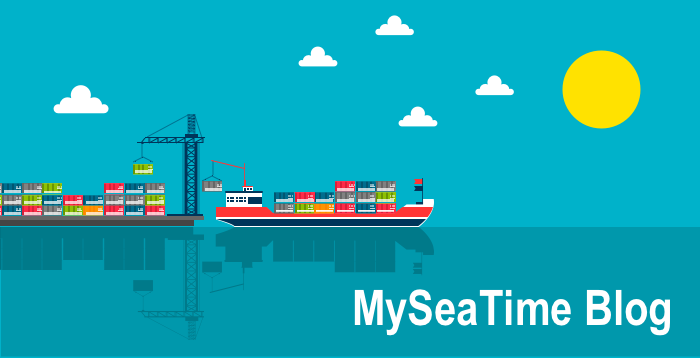 Even though shipping is safer these days, many cargoes still do not reach their destination or reach in bad shape. And when that happens, one should know who had the title of the goods lost. For that reason, It is important for buyer and seller to pre-define the responsibilities and obligations for transport of the goods. INCOTERMS are all the possible ways of distributing responsibilities and obligations between two parties. Point of delivery: Incoterms defines the point of delivery of the goods by seller to buyer. The meaning of delivery here is”transfer of risk and responsibility”. So the INCOTERMS defines the point of change of hands (passing of risk) from seller to buyer. Arranging for the main transport does not mean the risk is with the arranging party. Seller may arrange for the main transportation even when the consignment is already delivered (that is risk has passed to buyer). In this case the risk has passed to the buyer and seller is just acting as the shipper without any risk to him. Arranging for the insurance does not mean that risk is with the party arranging the insurance. In few of the INCOTERMS, seller arranges for insurance to cover buyer’s risk. In these cases, seller is only required to cover minimum risk as defined in the minimum risk clause in respective incoterm. Buyer must take more insurance to cover any extra risk that he wishes to insure against. There are total 11 INCOTERMS defined by the ICC . The 11 INCOTERMS are based upon the consideration of least responsibility of the seller to least responsibility of the buyer. For example INCOTERM EXW (ex-work) considers least responsibilty for the seller. Same way INCOTERM DDP (Delievered duty paid) considers least responsibility for the buyer. We can say that all other nine INCOTERMS lies between these two extremes. One last thing before we take the incoterms head on. Lets differentiate and group together each Incoterm. First on the basis of mode of transport that they are used and second based upon the point of delivery. 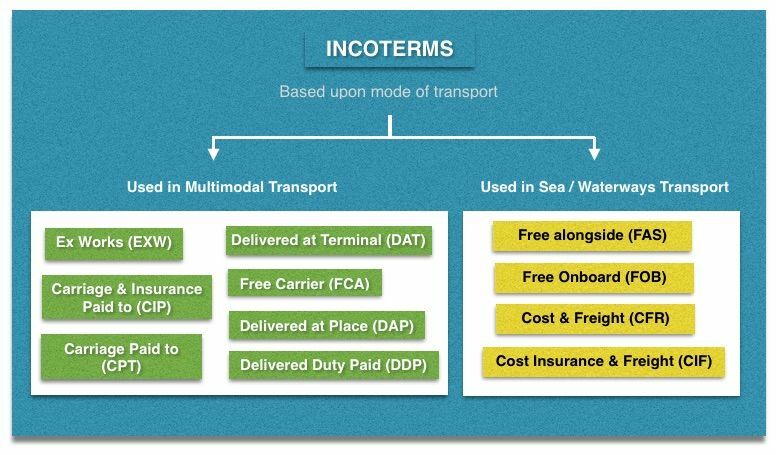 Incoterms can also be grouped together in 4 categories based upon the point of delivery. In group “E” (Ex-works), the delivery point is seller’s premises. In group “F” (FOB, FAS & FCA), the delivery point is before or upto the main carrier, with main carried unpaid by seller. In group “C” (CFR, CIF, CPT & CIP), the delivery point is upto and beyond the main carrier with carrier paid by seller. And finally in group “D” (DAP, DAT & DDP), the delivery point is the final destination. buyer arranges for all modes of transport . Ex-works is often used while making quoting initial prices for sale contracts. In practice, this incoterm can have practical difficulties specially in cross border assignments. These difficulties may include buyer’s inability to arrange for export formalities. As in Ex-works, DDP can also have practical difficulties in cross border assignments. In DDP, seller is responsible to clear the import formalities but the seller may not have the local knowledge & expertise to clear import formalities. “FCA seller’s premises” might look similar to Ex-works but there is one main difference. In FCA, seller has the obligation to load the goods on the carrier. By cost and freight, it means while seller bears cost and freight of shipment to the destination but the risk is with the buyer. And that is also the main difference between CFR and FOB incoterms. In FOB, seller delivers the shipment and passes the risk to buyer when shipment crosses ship’s rail. But, in CFR, he also pays for the costs and freight until the shipment reaches to the destination. This was exactly the point discussed earlier. Arranging for the transport does not mean that the risk is with the party arranging the transport. In this case, seller arranges the main transport (Seller is the shipper), but he has already delivered the shipment or passed the risk to the buyer upon shipment crossing th ship’s rail. There is only one but obvious difference between CFR and CIF and that is addition of Insurance. Seller passes the risk to the buyer when the shipment is loaded on the carrier. But the seller also arranges for the main carrier (Seller is the shipper). Apart from that seller also pays for the insurance for covering the buyer’s risk during carriage of the shipment. As seller would be paying to cover the buyer’s risk, he would offcourse wish to have least insurance just to cover his obligations. Buyer must take this into account and take extra insurance if he wish to. As simple as it sounds. The seller delivers the shipment to buyer when the goods are alongside ship. Risk passes from seller to buyer when the good are brought alongside the ship. Buyer arranges for the main carrier (Buyer is the shipper). Buyer pays for the all the insurance after this point. Seller pays for the main carriage to bring the shipment at agreed place. However the seller passes the risk to the buyer upon delivery to the main carrier. This is the point that we highlighted earlier. “Arranging for the main transport does not mean the risk is with the arranging party”. Here even when the seller arranges for the main carrier, risk has already passed to the buyer. Buyer also arranges for the insurance from the point of delivery. In CIP, Seller delivers the goods and passes the risk to the buyer upon delivery to the main carrier. Seller arranges and pays for the main carrier (Seller is the shipper) to bring the shipment at agreed place. Seller also arranges for insurance on behalf of buyer to cover buyer’s risk. The main difference between CPT and CIP is that the insurance is also paid by the seller. Again this point was highlighted earlier. “arranging for the insurance does not mean that risk is with the party arranging the insurance”. Here Seller pays for the insurance but the risk is not with him. Seller arranges for the insurance to cover buyer’s risk. CIP requires seller to arrange for insurance equals to 110% of the cargo value under minimum insurance claim. Buyer must insure himself against any additional risk he thinks need insuring against. DAP means seller delievers when shipment arrives at final destination, ready for unloading from the arriving mode of transport. Seller bears all the costs and risks in bringing the goods to this place. 1) Seller handles export fees, carriage, insurance and destination port charges. 2) Buyer handles import fees and unloading of goods. Seller delivers the shipment and passes the risk to the buyer when shipment is put at the disposal of buyer at the terminal of final destination. Seller handles export fees, carriage, insurance, destination port charges and unloading of the goods. The main difference between DAT and DAP is that in DAT, seller handles the final unloading of the goods. 1) Failure to include the precise place alongwith the destination. The use of Incoterms need to specify the precise place. For example FCA Durban does not specify the precise location as Durban is a broad area. Incoterm must mention the exact location in Durban. For example, FCA Durban berth no 42. 2) Use of DDP incoterm without considering if the seller has the knowledge and expertise or if local regulations allows him to clear import formalities in buyer’s country. 3) Use of EXW incoterm without considering if the buyer has the knowledge and expertise or if local regulations allows him to clear export formalities in seller’s country. 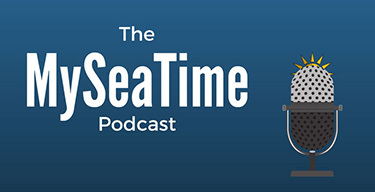 4) Using “sea or inland waterways” incoterms for containerized goods. 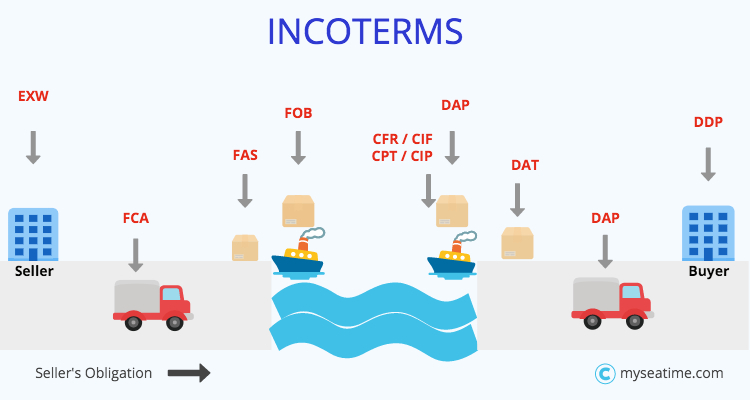 These four incoterms which are used for sea and inland waterways are not meant for containerized goods. These are actually meant for bulk cargoes and non- containerized goods. Use of these incoterms for containerized goods can put exporters at undue risk as the goods may have to wait several days before despatch. If you are still in doubt as to which Incoterm you should use where, here is a useful tool you should check. The tool was created by The Belgian foreign trade agency in collaboration with Always consult. The best guide for incoterms I have ever seen. You made this topic very simple sir. And if I may notify you a very minute thing, In fig.3 (Incoterms Based upon the Mode of transport) abbreviation for Cost Insurance & Freight is mentioned as CFR instead of CIF. Just a suggestion to make this article perfect Sir. Glad that you like it Rohit. Thanks for pointing out the typo error which I have corrected. Nothing can give more pleasure than having attentive readers. Thanks for reading. quite good visual and easy explaination given, Thanks Rajeev. One query I have though, we also had DEx - Delivered Ex Ship , is this Synonym to DAT or ExW? Glad that you liked it baadal. Regarding your query, the DEX is not a synonym for any of the incoterms. Incoterms are revised/reviewed once every 10 years. In 2010 when these were reviewed, 4 existing incoterms were removed and 2 new incoterms were introduced. The 4 incoterms that were removed were DEX (Delivered ex ship), DAF (Delivered at Frontier), DAQ (Delivered at Quay) and DDU (Delivered duty unpaid). The 2 new incoterms added were DAT (Delivered at Terminal) and DAP (Delivered at place). If you are using Incoterms 2010, you will not find DEX anymore. Glad you liked it Ankit..
Its an awesome article Raj! Very useful. 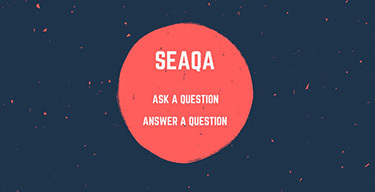 I may come back with a few queries.... Hope you wont mind.. Thanks Jana.. you are most welcome with your queries.. Yes we can use that and we need to highlight this in the contract so that it is clear who has what responsibility. But this is not very common and someone want to use DPA minus insurance, he would like to choose DAP instead and pay for insurance as anyway he has to pay for insurance. Or else he can request the other party to choose insurance from one of his preferred company. May I have your permission to cite the pictures on this blog for teaching purpose? Thank you! Very informative and well presented. Thanks!